Nothing really bashes the heck out of a weak desk-monkey like spending a week digging a really big hole and hauling heavy blocks around. On the other hand, the end of the day is satisfying in a way few desk jobs ever are. 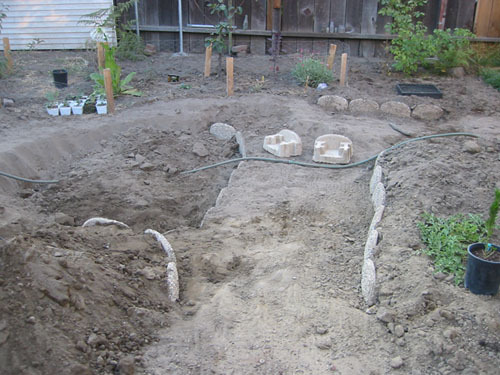 Today I finished the last remaining bit of the upper pathway, and began to work along the sides of the main pit. I'd originally intended to only set in three blocks and move the big pile from the pit, but I got on a roll and then Noel called to say he'd be home late, and the next thing you know, I've used up almost all the blocks. The big task today was clearing that huge sand pile out of the middle of the pit, so I had more room to work. I used it to build up some of the surrounding beds, giving them some definition. OK, plain sand is not exactly heaven for plants, but it's better than just stacking it somewhere and hoping it will go away. Also, now you can see my nice lower row much better. The project looks less neat and defined from the back yard. I still need to set in blocks along both sides to make the basin. Lots more digging, and a few more trips to Home Depot in my future, I think. 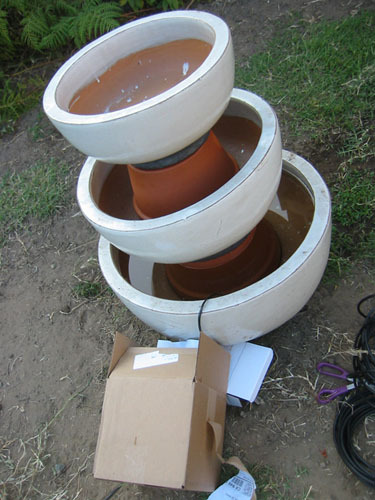 The solar fountain pump arrived around five-thirty, effectively right when I could not test it because the sun was so low in the sky. I threw things together anyway, and will check on it tomorrow morning. When it was hot at midday, I finally planted the shrubs I got from Forest Farm. I was moderately ticked off because they came loaded with snail eggs, but I got over it. I labeled them on the photo because I guess only I can tell where they actually are in there. 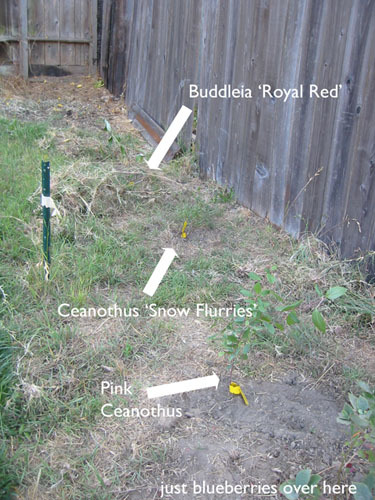 They're pretty small shrubs, as you can see, but they all grow well and vigourously in this climate. 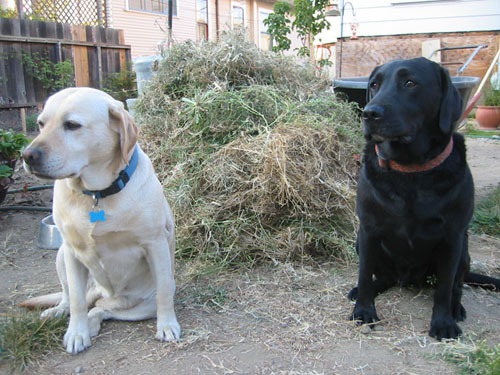 I also raked up more weeds and made this huge pile, modeled by the dogs so you can see how big it really is. I'm not sure if this says, "You have a lot of energy" or "You are a really messy weeder." Did you use some plastic or fabric behind the new landscape bricks to keep the dirt from pushing out between the bricks before back filling? Nope. I know, that's not a forward-thinking kind of construction. 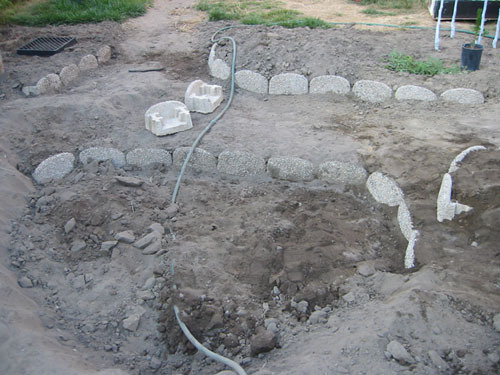 But I wanted a little dirt seepage though the blocks, to soften the Block Wall Here effect. 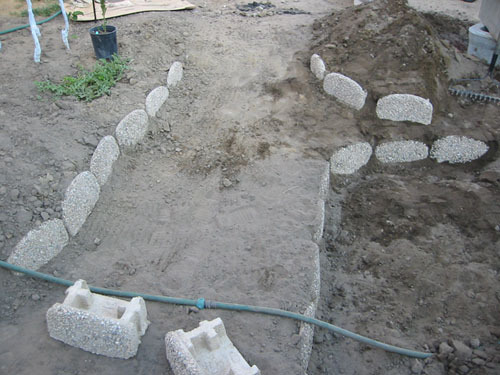 The blocks are mainly to define the pathway and keep it from sloping too heavily into the basin, not to actually hold the sand back (oddly, it does that on its own).